A wonderful tough little evergreen sun loving shrub Halimium lasianthum subsp ‘Formosum’ (syn. Cistus lasianthum), usually shortened to simply Halimium Formosum. 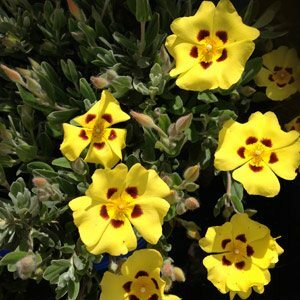 With its masses of yellow flowers from spring through summer Halimium Formosum has attractive silvery green foliage and bright yellow flowers with a deep red/brown ‘eye’ near the base of each petal. Also known as the great sun rose this is an excellent choice for hot dry conditions and it does cope well with seaside conditions and part shade as well. Excellent as a border plant in a a rock garden as well as in cottage gardens. Reaching around .5m in height and spreading for around 1m this tough little plant finds a home in many Australian gardens. Halimium Formosum requires very little care is required although plants do benefit from being pruned back each year to maintain a more compact shape. Many gardeners like to prune back lightly after flowering to encourage a second flush of flowers as well as maintain a bushy habit. Mulch well with a good open mulch, use a general all purpose slow release fertilizer in early spring and water during summer when hot dry spells can cause plants to suffer a little. Plants are generally available in nurseries from September to November when they are in flower.